Can we get an option to stop the global inbox from marking everything as read? Sometimes I'll come back to SO after a few hours (gotta sleep sometime), and I'll have a bunch of comments waiting for me. A lot of my answers lately have spawned mini discussions as I help solve new issues and corner cases, and I'd like to reply to them all if I can. When I click the global inbox, it sets every message to "read" status. This is fine if I open everything in a new tab, but sometimes I'll only notice the top comment and click on it, and the other replies get lost. I'd like it if we could have a setting whereby we have to either explicitly say to mark an item as read, or at least click on the item before it gets marked. This is probably best as a preference, since some folks in chat didn't see this as a problem. We generally don't do preferences, so this is unlikely. I'd much rather pick a sane default that works for 90% of folks than have a bunch of configuration options. Stack Overflow developed and launched Stack Overflow, without actually hiring a real, paid employee, until 4 months after the platform launched! This absolutely did not happen by accident or because Jeff Atwood drank a bunch of Starbucks coffee and started feverishly programming away every conceivable possible feature. (I'm assuming Jeff handled most of the coding in the early days based on the fact that they announced Jarrod Dixon was hired 4 months after Stack Overflow's beta. See the blog for more details). The more preferences there are, the more bloated an application becomes. For a small development team, supporting every whim of every user can quickly become costly. While the team is now 60 Valued Associates strong, maintaining focus still yields its rewards. Consider all the spec writing, design decisions, maintenance, bug fixing, unit testing, hallway usability testing, code optimization, and not to mention all of the complexity involved in making requests to the server and/or database. Whenever the system must perform an action, it now must check with the boss (the server/cache, etc) to see if that's okay. This is inefficient, and makes it hard for developers to adapt new features if they constantly have to battle with the complexity of user preferences modules. It's extremely difficult to say no to your users, but that's a skill that -- when mastered -- can keep your small, agile team tightly focused on the main goals, which is building a great Q&A platform. While the development team remains extremely focused on Q&A, they also just happen to have made another very good design decision: They created an API! If your pet feature isn't available, and you can do a little coding, or if you know someone who can do a little coding, you can develop a user script that utilizes the API to add your desired functionality to the site. For instance, I really missed the old reputation line graph that used to appear in my profile to show how my reputation changes over time. One of the Stack Exchange developers actually spent his free time writing a Reputation graph user script that adds this back to my profile. I haven't looked into your specific request myself yet, but check out the Global Inbox **Unviewed Count** API. With the right person and enough free time, your feature request could become a reality. Not the answer you're looking for? 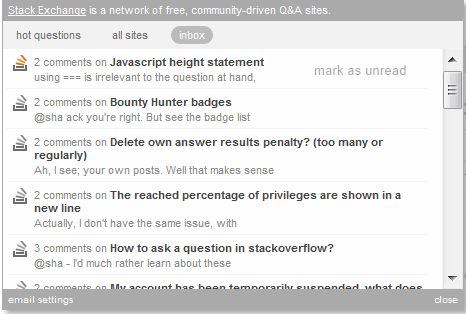 Browse other questions tagged feature-request status-declined global-inbox . Make notification alerts persist until links are clicked? Suggestion for notifications: Don't un-highlight any until clicked. Make it an option? Is seeing other people's favorites a privacy issue? Can there be an option to keep your list of favourites private? Why does the global inbox notify me again of messages I've already viewed in the inbox?